Tiny, yellow trout lilies covered the forested hill, their bold blossoms standing out against the drab carpet of dead leaves. The wildflower, emerging in the spring, is one of the first pops of color in Maine forests each year. Its slender petals curve outward into the shape of a six-pointed star. In the woods of Annie Sturgis Sanctuary in Vassalboro, patches of these lilies cover the ground in early May, when leaves are just starting to unfurl on the trees. They draw the eyes of those who visit to walk the preserve’s network of footpaths. Beneath its yellow blossoms, the flower’s greenery is also eye catching. The long, pointed leaves reach up from the forest floor and spill outward, green mottled with brown, like the coloring of a brook trout. A common plant throughout Maine, the trout lily says “Spring is here at last” and is soon joined by a variety of other woodland flowers, pushing through the matted brown leaves, stamped down by months beneath the snow. Home to a wide variety of woodland flowers, the 40-acre Annie Sturgis Sanctuary features a 2-mile trail network that is owned and maintained by the New England Wild Flower Society. 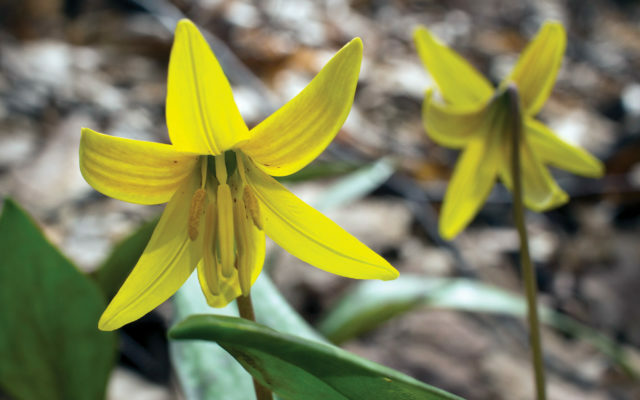 Wildflowers that you’ll see on this walk include white-petaled bloodroot, vibrant yellow trout lily and a deep red, three-petaled flower called purple trillium. Other highlights of the trail network include what’s thought to be the largest stand of wild ginger in Maine, a scenic brook and an old chimney that stands atop a forested hill known as Mount Tom. Dogs are not permitted, and the trails are for foot traffic only. The sanctuary is only open dawn until dusk, April 1 through Oct. 31. For more information, visit www.newenglandwild.org or call the sanctuary stewards at 207-623-9340. Directions: Take Interstate 95 to exit 113 (Augusta/Belfast), then go east on Route 3 for 1.7 miles, crossing the Kennebec River. Just after crossing the river, at the intersection of Route 201 and Route 102, turn left onto Route 201 and drive north for about 4.1 miles. Turn left onto Cushnoc Road (in the town of Vassalboro) and drive approximately 1.5 miles and the sanctuary trailhead will be on your left, on the west side of the road. Park on the shoulder of the road, well out of the way of traffic and without blocking any nearby driveways. Keep in mind that the sanctuary trail crosses private property. Stay on trail and respect the privacy of nearby landowners. Established in 1937, Moosehorn National Wildlife Refuge covers nearly 30,000 acres in Washington County. Managed by the U.S Fish & Wildlife Service, the refuge features numerous hiking trails and woods roads that travel through forest and fields filled with wildflowers that are native to the region, including lady’s-slippers and wild rhodora. Your walk in the refuge can range from easy to challenging, depending on the trails and roads you choose to travel. The 0.3-mile paved Woodcock Trail was constructed to be wheelchair accessible and is a great place for spring birding. The 3-mile Headquarters Loop Trail is an interpretive walk on dirt roads that visits several ponds and wetlands, as well as mixed forests and fields. And for the adventurous, there are quite a few rough, narrow trails that travel through old-growth forests. The most challenging aspect of walking on this property in the spring is the abundance of blackflies and mosquitoes that will inevitably pester you. I suggest hiking with the majority of your skin covered with clothing and the rest covered with good bug repellent. You could even wear a head net. Dogs are permitted if on leash at all times, and bikes are permitted on certain roads and trails. For more information, call 207-454-7161 or visit fws.gov/refuge/Moosehorn. Directions: The Baring Division of the refuge is located in the town of Baring, which is just southwest of Calais in Washington County. From the intersection of Main Street and North Street in downtown Calais, drive west on North Street 3.3 miles (the road is also Route 1 and will become Baring Street), then turn left onto Charlotte Road. Charlotte Road leads through the refuge. As you follow the road, you’ll come across a few trailheads and a wheelchair-accessible wildlife observation deck. Follow Charlotte Road 2.4 miles, then turn right onto Headquarters Road, which soon splits to become a 1-way road that forms a loop and visits the refuge headquarters and a few different parking areas for various trailheads. Owned and maintained by the Bangor Land Trust, the 205-acre Walden-Parke Preserve is known as an especially great place to enjoy lady’s-slippers in the spring. These showy woodland flowers are orchids and require specific habitats in order to grow. Collecting them is discouraged, considering some species of lady’s-slippers are quite rare. Instead, bring a camera on your hike to capture their beauty in a more lasting way. Walden-Parke Preserve features a trail network that leads walkers to a large beaver wetland, hardwood and softwood forests, vernal pools and a portion of Caribou Bog. The main trail in the network, the Blue Trail, forms a loop hike that is about 3 miles long. And branching off of that are several side trails that visitors are welcome to explore. Dogs are permitted but must be on leash at all times. Bicycles are permitted as well. For more information, visit www.bangorlandtrust.org or call 207-942-1010. Directions: From the Stillwater Avenue-Essex Street intersection in Bangor, drive about 4 miles north on Essex Street, passing Church Road on your left. Take you next right onto Walden Parke Way at the entrance of the Edgewood Subdivision. Take the next right onto Tamarack Trail (a road). At the end of Tamarack Trail is a small parking area, a Bangor Land Trust kiosk and the trailhead. For more of Aislinn Sarnacki’s adventures, visit her blog at actoutwithaislinn.bangordailynews.com. Follow her on Twitter: @1minhikegirl. Her guidebook, “Family-Friendly Hikes in Maine,” is available at local bookstores, Down East Books and online booksellers.